Chimpanzees are our closest relative in the animal kingdom, sharing around 98% of human DNA. These intelligent great apes live in the tropical rainforests, grasslands and woodlands of western and Central Africa, with a large concentration along the Zaire river. Chimpanzees are social animals who care for their offspring for years, and they live in hierarchical social groups of between 16 to 100 individuals. There is always a dominant male in each group, and lower-ranking males will sometimes work together to try to oust the leader from his position! These clever animals have fascinated scientists for years. Studies have discovered that chimpanzees can create and use tools, intentionally treat illnesses with medicine and have other abilities which we once thought were unique to humans. 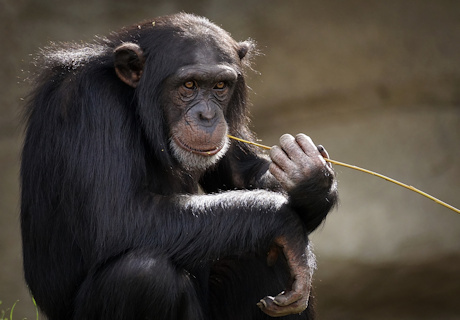 Chimpanzees even like to entertain themselves by solving puzzles! Communication is another big part of chimpanzee life, and they use facial expressions, hand-clapping, body language and kissing to communicate with each other. Chimpanzees are omnivores. They eat mostly plant-based foods, but they also enjoy eating insects, eggs, honey and meat. Fruit makes up 50% of their daily diet. Although chimpanzees tend to walk on all fours (knuckle-walking), they are also capable of walking upright. Males can be as tall as 1.6 m (5 ft 3 in) when standing. Due to deforestation and illegal trading, chimpanzees are now an endangered species. There were around 2 million chimpanzees living in the wild at the beginning of the 20th century, and that number has dropped to between 170,000 and 300,000. Chimpanzees can recognise themselves in a mirror (unlike most animals). One chimp, Washoe, learned approximately 350 words of sign language. She also used her communication skills to form friendships with humans. When chimpanzees are scared, they show a grin of fear, similar to a nervous smile that a human might have in a tense situation. The human race is the biggest threat to chimpanzees, but they are also hunted by leopards and other big cats. Chimpanzees sleep in nests of leaves, and usually make a fresh, clean bed each day! 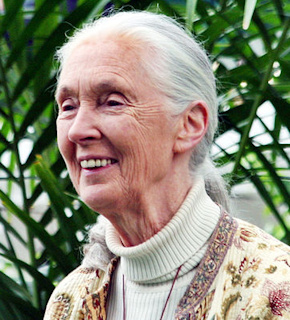 Much of what we know now about chimpanzees was discovered by Jane Goodall, who dedicated her life to working with chimps and their conservation. You can learn about her here in our Famous People section! This cute chimp acrostic poem printable is great for challenging the children on their poetry skills, and it makes a fun writing frame too.. Learn some fun facts and interesting information about chimpanzees with this cloze worksheet, by reading the text and filling in the missing words from the word bank. Chimpanzees are everyone's favourite monkey, and this cute chimpanzee colouring page will go down well with the kids. It features the word underneath the picture, too. This is a fun way to learn to draw a chimpanzee, also useful for practising counting, copying skills and pencil control. Copy the chimpanzee from the grid on the left to the grid on the right, square by square. I love this chimpanzee lacing card and I think the kids will too! It makes a fun lacing or sewing activity for the kids. Laminate for extra strength and if you wish to reuse. Use our printable notebooking pages to write about the chimpanzee, our closest relative in the animal kingdom. Choose from two designs, and just click on the links below to download printable versions. Perhaps you could use our chimpanzee writing page to write a diary entry of a visit to the zoo or safari park? Available in colour, or in black and white below. There's a cute chimp decorating our chimpanzee writing paper, which is available in three versions to suit all ages. The cheeky chimps on this writing paper should encourage the kids to put pen to paper - whether for a letter, writing about a trip to the zoo or for their own story. Three versions available below. Kids can print out and complete the picture of this cute little chimpanzee before colouring it - fun for little ones! Much of what we know about chimpanzees is because of the research of this remarkable woman!